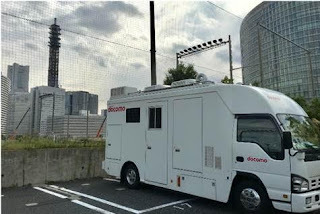 In Minato Mirai 21, Yokohama, Japan's largest mobile communication operator NTT DOCOMO and leading global ICT solutions provider Huawei jointly achieved a significant field trial milestone. This trial focused on the Ultra-Reliable and Low-Latency Communication (URLLC) use-case with a macro base station on the 4.5 GHz frequency band (C-Band) using a new radio interface of similar features such as 3GPP 5G New Radio (NR) air-interface. The test results have demonstrated that the current 5G trial system over 4.5 GHz can meet the performance requirements for URLLC as defined by the International Telecommunication Union - Radio Communication Sector (ITU-R). The completion of the trial has paved the way for large-scale macro cell deployment to support URLLC, while laying a solid foundation for the extensive application of 5G NR across various vertical industries. During this trial, an air-interface with a time-slot frame structure of 0.25ms and transmit receive diversity technology were utilized. This resulted in a radio interface latency of below 1ms and a packet success probability of over 99.999% for a packet size of 100 bytes within a 1 km2 coverage area (provided by a 5G macro base station). Huawei has been partnering with DOCOMO to continuously drive the development of innovative 5G technologies since 2014. These combined efforts will contribute to the creation of more 5G application scenarios and services that require higher reliability and lower latency (such as remote control, tactile internet, industrial intelligence, and AR). Huawei and DOCOMO are committed to promote global 3GPP mobile communication standardization and the commercial deployment of 5G by 2020.